Specialty Sportswear is the creator of Skatewear Pattern, a Design System for stretch fabrics. There are Skatewear Patterns for Girls and Ladies figure skate dresses, Boys and Mens Skatewear pants and leotard patterns for Ice Skaters, Roller Skaters, Twirlers, Gymnasts, Dancers, Swimmers, Drill Teams, and for any other activewear used for Swimming, Aerobics or Wrestling. Over 100 skate dress design patterns to choose from with over a dozen skirt applications. We have custom pattern services. Do you have custom measurements or a custom design? We can create the pattern for you! If you need support with your sewing project, don't worry you can easily get on-line or telephone us for assistance. Now three patterns will fit into our first class envelope. Our service provider updated our ability to more closely regulate our postage, plus the USPS now allows 3 more ounces in a First-Class envelope!! This is a great way to order up to three patterns and not have to pay Priority Mail. The Manual is a detailed discussion about the idea behind the System, and how to use the System and all of it's design possibilities. Learn how basic sewing 101 methods are applied to LYCRA® fabrics. 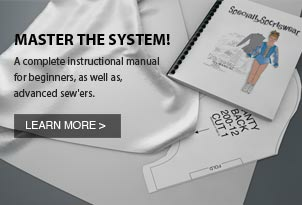 Learn the fine details and caveats of fitting stretch fabric patterns. Learn how to make patterns from scratch and use the SSW Design System to create your own design ideas! All prices are in USD © 1985 - 2019 www.specialtysportswearpatterns.com.